Smart Offers lets you define the settings for whether the offer should be shown for Hidden products or not, which offer should be shown first based on price, how many offers should be shown on a page and design Accept/Skip links. You can find Smart Offers Settings by going to WordPress Dashboard -> Woocommerce -> Settings -> Smart Offers. Show Offer for hidden products : This option lets you decide whether you want to show offers on a Hidden product or not. 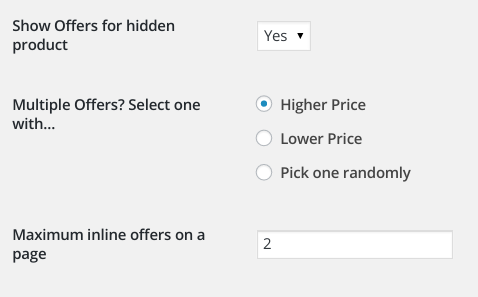 For eg, If the selected product is set to Hidden and this option is set to Yes, only then will Smart Offers show offers on those selected products. Multiple Offers? Select one with… : This options decide the priority of the offer to be shown to the customer if there are multiple offer satisfying the rules on a particular page based on offer’s offered price. For eg, There are two offers “A” and “B” having offer Price as $10 and $15 respectively both satisfying the display rules and the value of this option is set to “Higher Price”, Smart Offers will show “B”. If the value of this option is set to “Lower Price”, Smart Offers will show “A”. If the value of this option is set to “Pick one randomly”, Smart Offers will choose any 1 of these offers randomly. Maximum inline offers on a page : This option lets you decide how many inline offers you want to show on a page i.e. when you want to show multiple offers on a page. Note: When you wish to show multiple offers on a page, all the offers will be shown as “Inline”. (A) Imagine you want to show 3 offers on Cart page, then set this option value as 3. Now if on Cart page, there are 4 valid offers, then Smart Offers will show 3 offers as the value under “Maximum inline offers on a page” is 3. (B) Now if you have added multiple shortcode on a page then Smart Offers will show offers as per the value set for ‘Maximum inline offers on a page’ in Smart Offers Settings for each of the shortcode. For eg. the value for “Maximum inline offers on a page” is 2. And you have added shortcode twice on a page. Then Smart Offers will show 2 offers for each of the shortcodes i.e. in all 4 offers on a page. It lets you define styles for “Yes, Add to Cart” and “No, I want to skip” links. By default, Smart Offers adds default styling for the links. For Accept Link (Yes, Add to Cart) : Smart Offers provides 3 pre-defined styles for the Accept link. You can use one from that OR you can design and style Accept link the way you want from the custom style box. For Skip Link (No, I want to skip) : Design and Style the Skip link the way you want from here.